Buzz, buzz, buzz. 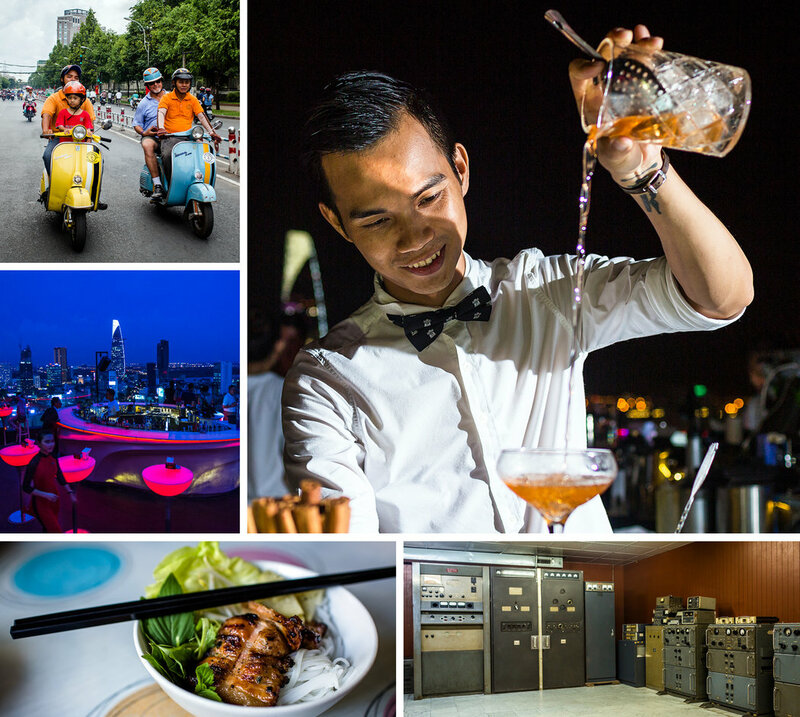 Whether it’s the roar of motorbikes, the near constant opening of bars and restaurants, the chatty nature of its inhabitants, or the abundance of great coffee, there’s just something invigorating about Ho Chi Minh City, Vietnam’s largest metropolis. It’s no surprise that Saigon, as most locals call it, exudes a youthful, inventive energy — after all, over half of its eight million dwellers are younger than 35. This dynamic spirit shines through in quirky cafes, innovative cuisine and boutiques selling homegrown fashion. And when you need a breather from all that’s new and fabulous, it’s easy to steal quiet moments in crumbling colonial buildings and contemplative art spaces. 1. Who Crashed the Party? | 3 p.m. 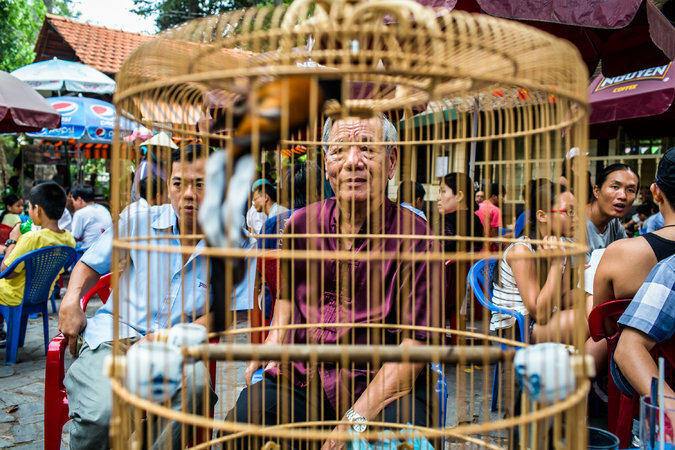 The entrepreneurial Saigonese may seem unstoppable, but it wasn’t always this way. The Reunification Palace (entry 30,000 Vietnamese dong, or $1. 46 at 20,506 dong to the dollar), the former headquarters of the South Vietnamese government, looks just as it did on April 30, 1975, the day a North Vietnamese tank crashed through its gates, marking the end of the brutal 20-year war. History buffs and fans of modernism will appreciate its opulent, well-preserved interiors, which range from official rooms adorned with heavy silk upholstery and intricate lacquerware to the Gambling Room with its low-slung olive-green armchairs, where it’s easy to imagine officials plotting the war over booze and cards. A labyrinth of underground concrete rooms dedicated to the war effort is filled with maps, pastel rotary phones and humorously large radios. 2. Served Up | 5:30 p.m.
3. Country Kitchen | 7 p.m.
With its chipped vintage dishware, bookshelves stuffed with tattered novels and vinyl records, and recycled wood tables, Cuc Gach Quan is a breath of fresh air in the city’s sleek facade. Tran Binh, the architect-owner, opened the restaurant in a French colonial building as an ode to his grandmother’s country home, blending nostalgia and Vietnamese home cooking with an eco-flair. Fresh ingredients are used in the expansive menu (there are 35 vegetables alone to choose from) with highlights like deep-fried tofu with lemon grass and chile and a crispy sea bass in passion fruit sauce (both 90,000 dong). A few streets away is a sister property, Cuc Gach Café, a midcentury-inspired space with a daily menu (100,000 dong) and fruit smoothies. 4. Celestial Vibes | 10:30 p.m.
A popular cafe by day, La Fenêtre Soleil turns into a chic house party on weekends, when live bands and D.J.s play everything from dancehall ska to psychedelic 1960s Asian pop. Hipsters, artists and 20- and 30-somethings flock to the romantic space — huge windows, mismatched armchairs, gilded mirrors and framed antlers on the walls — to sip red wine and dance the night away. Newly opened Observatory is positioning itself as a hub for the city’s alternative cultural scene, hosting live music and D.J.s in the evenings and art openings and readings during the day. Weekend parties continue into the wee hours — sometimes well past sunrise. 5. Vroom Vroom | 8 a.m.
6. Simple Pleasures | 12:30 p.m.
7. Buy Local | 2 p.m. Tempted as you might be to don the classic mandarin-collared ao dai tunic, why not take home a souvenir that’s a little more au courant? A good place to start is Ginkgo Concept Store, which focuses on sustainably made items from clothing by local designers (check out Linda Mai Phung’s organic cotton and silk line) to gorgeously packaged bars of Marou chocolate, Vietnam’s first single-origin, handmade chocolate using local cacao beans. Boho-chic Mai Lam offers avant-garde interpretations of traditional Vietnamese styles in intricately sewn, eco-friendly materials, on the city’s stylish shopping street Dong Khoi. Anna Vo is stocked with hound’s-tooth cropped tops and lace mini-dresses designed by a Milan-trained Saigonese fashionista. 8. Art on the Rise | 4 p.m. Though Hanoi is considered Vietnam’s cultural hub, Ho Chi Minh City’s more open-minded atmosphere is now fostering its own creative scene. Housed in a former factory, Galerie Quynh is a contemporary gallery, putting on several shows a year that examine the Vietnamese psyche. The nonprofit San Art supports experimental work, while Craig Thomas Gallery is run by an American who’s been involved in the local art scene for over 10 years. 9. Global Tastes | 7 p.m. The city’s progress has brought with it a new wave in taste, evident in the booming restaurant scene that spans a global palate. At Pizza 4P’s, down an alley off the main street, four friends from Tokyo bring the precision of Japanese cooking to thin-crusted Margheritas topped with homemade mozzarella, and pies inspired by their homeland, like the calamari-seaweed pizza (from 95,000 dong), baked in a wood-fired oven. On the former grounds of an opium refinery, Blanchy Street is run by two Nobu London-trained chefs, Martin Brito and Yogo Oba. In an intimate space with pretty tile flooring and wooden tables, the pair fuse Japanese and South American flavors with panache, serving such dishes as octopus carpaccio with jalapeño sauce (180,000 dong), along with a sushi and sake menu. 10. Beautiful People | 10:30 p.m.
At the Park Hyatt’s 2 Lam Son bar, a stunning example of old-meets-new with its latticed screens and glass bauble light fixtures, unwind with a ginger martini (210,000 dong) in one of the romantic, fabric-draped nooks or grab a street-facing cocktail table, watching the city’s youth zip by on mopeds. D. J.s perform on Fridays and Saturdays. Xu, which also houses a modern Vietnamese restaurant, attracts the see-and-be-seen set, who don high heels, short skirts and flat-ironed locks while sipping drinks prepared with ingredients like sugarcane juice and kumquats (from 120,000 dong) accompanied by thumping music and paintings of figures like Richard Nixon and Napoleon. 11. Colonial Cuppa | 10:30 a.m. Among the influences French culture has had on this former colony, two enduring examples are great coffee and architecture, which come together at L’Usine, down an alley lined with art stalls off Dong Khoi. 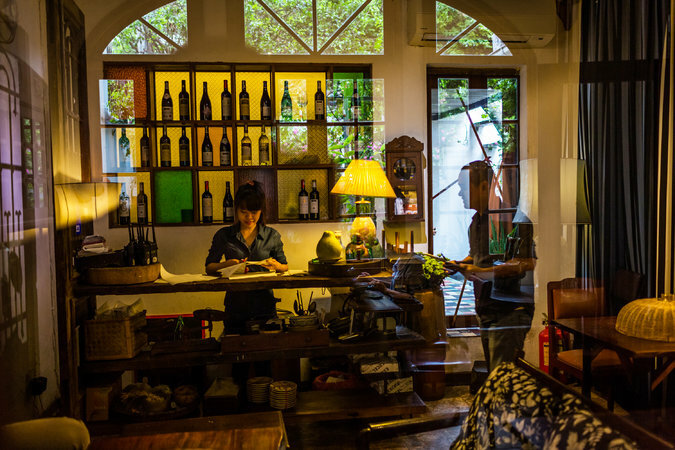 Opened by a group of 30-something expat friends, the cafe-boutique is in a grand 1890s structure that was once the Hotel de Saigon. It is now restored to much of its original glory, with soaring cast-iron pillars and arched windows punctuating the light-filled space. With a Vietnamese coffee in hand — dripped through a sieve and mixed with condensed milk — and eye-catching housewares and clothing by local designers, it’s the perfect place to ponder Ho Chi Minh City’s storied past and bright future. 1. The Reunification Palace, 135 Nam Ky Khoi Nghia; dinhdoclap.gov.vn. 2. Eon Heli Bar, Bitexco Financial Tower, 2 Hai Trieu; eon51.com. Chill Sky Bar, 76A Le Lai;facebook.com/like.chill.saigon. Shri, 72-74 Nguyen Thi Minh Khai; shri.vn. 3. Cuc Gach Quan, 10 Dang Tat; cucgachquan.com.vn. Cuc Gach Café, 79 Phan Ke Binh;cucgachcafe.com.vn. 4. La Fenêtre Soleil, 44 Ly Tu Trong; 84-8-3824-5994. Observatory, Corner of Le Lai and Ton That Tung; facebook.com/theobservatoryhcmc. 5. Vietnam Vespa Adventures, 169a De Tham; vietnamvespaadventures.com. 6. 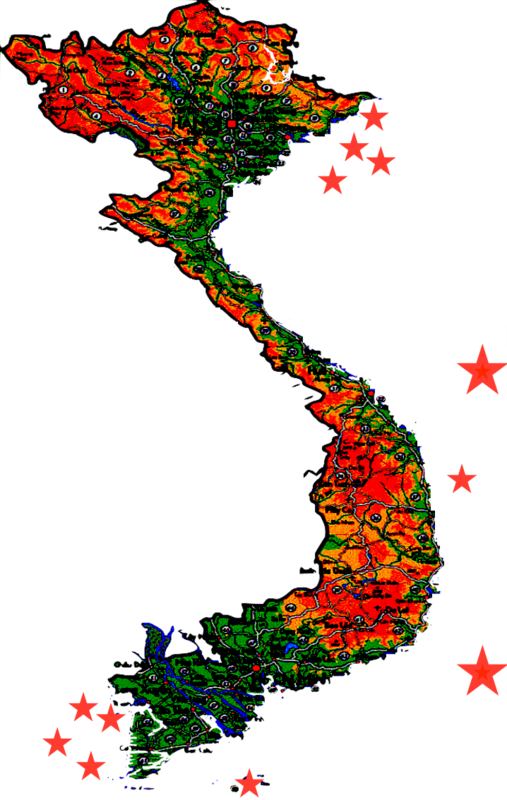 Quan Hoa Dong, 121 Ly Tu Trong. Thanh Binh, 140 Le Thanh Ton; quananthanhbinh.com.Che My 2, 119 Nguyen Thai Hoc; chemy2.com. 7. Ginkgo Concept Store, 254 De Tham, ginkgo-vietnam.com. Mai Lam, 132-134 Dong Khoi;mailam.com.vn. Anna Vo, 21 Vo Thi Sau; annavo.vn. 8. Galerie Quynh, 65 De Tham; galeriequynh.com. San Art, 3 Me Linh; san-art.org. Craig Thomas Gallery, 27i Tran Nhat Duat; cthomasgallery.com. 9. Pizza 4P’s, 8/15 Le Thanh Ton; pizza4ps.com. Blanchy Street, 74 Hai Ba Trung;blanchystreet.com. 10. 2 Lam Son, Park Hyatt, 2 Lam Son Square; saigon.park.hyatt.com. Xu, 71-75 Hai Ba Trung; xusaigon.com. 11. L’Usine, 151/1 Dong Khoi; lusinespace.com. The city’s most luxurious digs, the colonial-inspired 244 rooms at the Park Hyatt Saigon (2 Lam Son Square; saigon.park.hyatt.com; doubles from $250) have four-poster wooden beds and framed old photos. Inspired by Provence and a short drive from the city center, Ma Maison (656/52 Cach Mang Thang Tam; mamaison.vn; doubles from $78) has 12 rooms with ornate balconies and country antiques. If the idea of tranquil evenings spent lounging in your own villa (with private pool) to the sound of chirping crickets appeals, the 15-room An Lam Saigon (anlam.com; doubles from $240) is just a 20-minute boat ride down the Saigon River from the city center.